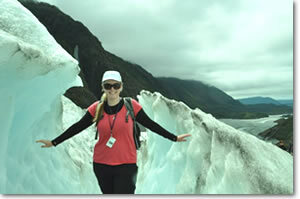 A once-in-a-lifetime holiday only comes around once, and if you want to spend it in a country that has it all, there truly is no better place to visit than New Zealand. From magnificent valleys enclosed by glorious snow-capped mountains and endless rolling green hills of wooly white sheep, to remarkable ocean peninsulas and golden sanded, turquoise watered beaches, the world's youngest country is without a doubt, the place to be. While many travellers choose to take the tour bus option, staying in hotels and B&B's, the best way to see it all, (and I speak from experience) is with a campervan. The freedom a campervan gives you will become evident from the moment you are handed the keys, when you are faced with the possibility of heading in whichever direction your heart so desires. My campervan adventure began right at the end of November and took me through to the early days of December. This would have to be one of the best times of year to visit because not only do you get the best of both worlds with the snow-capped mountains contrasted against lush, green scenic vistas, but you also avoid the crowds that the summer holidays and ski season brings. 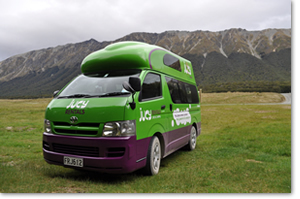 Flying into Christchurch is generally your cheapest option, and my advice is to stay in accommodation here so that you can wake up refreshed for picking up your camper. All the major campervan hire companies have depots here and many are ideally located near the airport. Christchurch is a city you will instantly fall in love with and is the perfect place to start your New Zealand adventure. 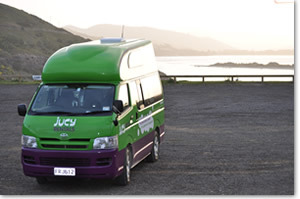 My travel buddy and I happily booked through the friendly team at Discovery Motorhomes and chose to travel in a Jucy Condo, the latest vehicle to be released by Jucy Lucy. Jucy is a brand specifically targeted to travellers aged between 18 and 30, making it perfect for us 20-somethings. We were fortunate enough to be the first people to hire out this particular Condo, meaning everything in it was brand spanking new! We picked up the camper first thing in the morning, avoided the crowds and got through the paperwork in less than 20 minutes. 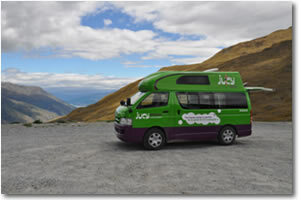 The Jucy team was incredibly friendly and extremely helpful in telling us where we could and could not travel. Discovery Motorhomes offers a fantastic stress-free insurance option, which (as the name suggests) is perfect if you are after a stress-free holiday. It is the highest level of insurance you can take out and is an ideal option if you don't have enough money to cover the bond. The friendly Discovery team advised of all the inclusions of the package and our obligations as hirers. The package came with linen, towels, and tea towels, and also included all the cooking utensils, making daily meal making a breeze. The Jucy Condo itself was incredibly decked out and boasted 2 double beds, a kitchen sink, a 2 burner stove top, an impressive fridge and plenty of cupboard and storage space. 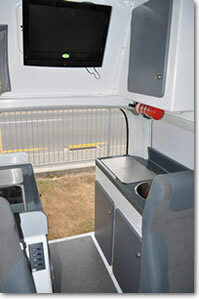 A large flat screen TV and DVD player provided onboard entertainment and the fold-out table extending out the back was perfect for meal preparation. The logo on the side of the Condo reads "Perfect for 2, great for 3, and a party for 4". This couldn't be any more accurate, as the two double beds were ideal for two people who like that little bit of luxury and space, while still being big enough to easily and comfortably fit two people in each . Another great asset of the Jucy Condo is that you can do all your cooking inside, and we found that this really came in handy when it was extremely cold outside and while camping at lakes, where sandflies fly about in a rampage for human blood. It also takes the hassle out of cooking outside when it's raining, which New Zealand is well known for. Fortunately for us, the weather throughout our two week trip was perfect. In fact, we couldn't have asked the weather gods for anything better! 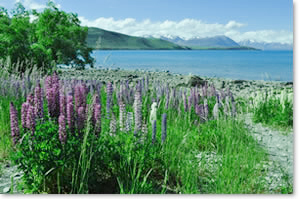 Our adventure took us from Christchurch, past the visually breathtaking lakes of Tekapo and Pukaki, to the amazing and awe-inspiring Mount Cook National Park. Although it was incredibly cold, Mt Cook was one of the highlights of the trip, with its magnificent snow capped mountains, deep valley gorges and incredible lakes scenery simply taking our breath away. Our camper was up for a change of scenery and took us towards the coast past the Moeraki Boulders , to the beautiful Otago Peninsula, where we encountered yellow-eyed and blue penguins, before discovering the understated beauty of Fiordland and the world famous, Milford Sound. There is a large handful of great little conservation camping sites located along the Milford Highway, and if you can handle very basic facilities, they are great bases for your stay in Fiordland. The scenery thus far had been absolutely incredible, with the windows of the Condo acting as picture frames for spectacular landscapes that seemed to go on for as far as the eye could see. From mountains and lakes, to thundering rivers and beaches, the options for a view to wake up to were endless. Our exploration of lakes (and invasion of sandflies) continued in Mavora and Manapouri (both Lord of the Rings filming locations) and in the beautiful village of Wanaka, where we braved the cold and took a dip in its crystal clear waters. We found a fantastic conservation campsite at Boundary Creek, on Wanaka's northern shores and enjoyed a twilight supper surrounded by superb mountain ranges, dense beech trees and the calm, peaceful waters of the lake. The Condo handled well on dirt and gravel road, making access to campsites like this a breeze. Crossing into Mt Aspiring National Park we were met with one of New Zealand´s most scenic drives. We spent an entire day making our way through the Haast Pass, stopping at all the fantastic short walks, rock pools and waterfalls, scattered along the way. Further along, we donned sturdy hiking boots to tackle Franz Josef Glacier, before taking our camper further up the west coast to check out the peculiar Punakaiki Pancake Rocks and discover a cheeky pod of curious New Zealand fur seals at Cape Foulwind. As our campervan soared high above the thundering waves of the West Coast, so did the petrol prices, with some towns reaching a mind-blowing $2.07/litre. The Condo was incredibly fuel efficient for its size, but it was still important to keep the fuel tank always above half-full, as distances between towns and petrol stations were vast. 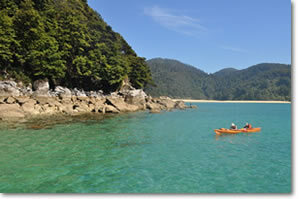 Up north we took a day's break from driving, with a boat cruise along the shores of Abel Tasman National Park exposing us to New Zealand´s most magnificent stretch of coastline. A stopover in one of the gorgeous bays gave us a once-in-a-lifetime opportunity to swim in the wild with a blue penguin, with seahorses and starfish also catching our keen eyes. The windy roads towards Nelson and Picton were great to explore and the Condo meandered along them with ease. The charmingly quaint seaside town of Kaikoura was just as appealing and extended out to a beautiful peninsula that was perfect for viewing unsurpassed views of the dramatic coastline. 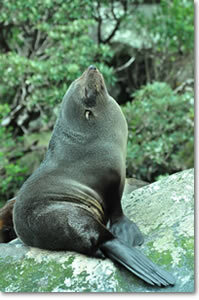 Our encounter with the local wildlife continued here as we snorkeled with the playfully cheeky seals around the rocky shores; minus the chilly temperature of the water, a definite contender for the number one experience of the trip. We finished off with a night of relaxation at the thermal pools at Hanmer Springs, which were a welcome relief from 2 weeks of steady driving. The Top 10 Holiday Park here was the cheapest park we had stayed at yet and provided excellent facilities for tired and weary travellers. The road back to Christchurch was an easy feat for us now well-experienced Condo drivers. We made a bee-line for the car wash to give our home on wheels a much needed bath, before fuelling her up and taking her back to the depot for the next group of lucky travellers to be fortunate enough to take her out. Check-in was quick and simple and the free shuttle service back to the airport made us well on time for our flight back home. Our Jucy Condo allowed us to cover just over 3,000 kilometres, but our eyes and hearts saw well beyond this and made this one of those unforgettable holidays we will one day tell our great grandchildren about. Please try other related articles such as suggested itineraries or testimonials.